The natural tooth is a complex unit made up of various substances with an intricate nerve and blood supply and is supported in the bone by the periodontal ligament. At present, if a tooth is lost, the world does not have anything that can replicate the unique system that is a tooth. The closest tool we have when planning the replacement of your missing tooth or teeth is a dental implant. A dental implant mimics nature by using an artificial titanium tooth root to support a crown, bridge or denture. The implant itself is placed into the jaw at the site of the missing tooth and encourages the surrounding bone to mesh and integrate with the implant (osseointegration). Once it is fixed firmly into place, it can be used to attach one or more false teeth. At Naidu & Naidu, we use Straumann Implants. With their headquarters in Basel, Switzerland, Straumann has a long history in the field of dental implants and are also involved in training and education for the profession. This is mainly in collaboration with the International Team for Implantology (ITI) of which Adit Naidu is an active member. 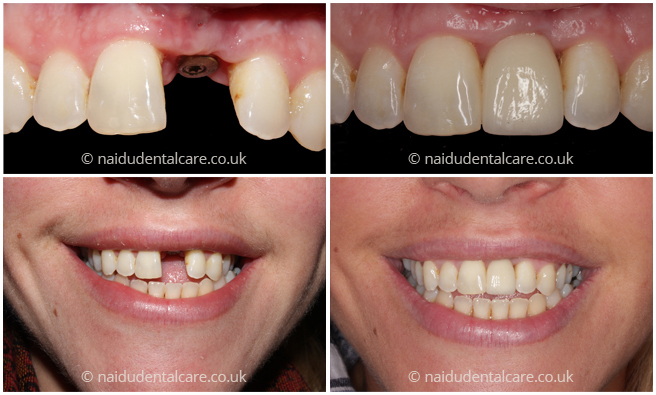 So, if you're missing a tooth or teeth, fed up with dentures or simply want to discover your options for a tooth with a questionable lifespan, please do not hesitate to call us and sit down for a chat with Adit to go through not just the implant-based solutions but all the options available for your concerns.